Classroom furniture is an integral part of creating a successful learning environment for students and teachers alike. Comfortable, flexible furniture that is designed to integrate and support learning is key to facilitating a dynamic teaching atmosphere. Whether you're setting up the classroom for primary school children or high school teens, university students or employees who are being trained for their jobs, the kind of furniture you choose is critically important to their success. Read our tips below for ensuring the furniture you select for your classroom will achieve the results you want. At its simplest definition, ergonomics literally means the science of work and has long played a key role in creating learning environments that keep students focused and comfortable. In the past, it was thought that too much body movement resulted in the loss of concentration and focus in children. Studies now show that providing flexibility or rocking features within the classroom furniture actually supports the body's natural inclination to shift and vary postures, which naturally increases our ability to pay attention, retain information more easily and also be more comfortable. Students have a wide range of ages and body types, and so classroom furniture must have the flexibility to adapt to their different bodies as well as different ideas of comfort. With adolescent obesity on the rise, students are becoming too large for traditional school desks. With adjustable tables and chairs, students are able to exercise some control over their level of comfort throughout the school day. Hands-on classrooms that mimic real-world workplaces are used to help students develop the practical skills needed for their respective career paths. For example, a student who is role-playing in a clinical situation should have the appropriate furniture and equipment that is similar to what they will be using after they graduate. Conference rooms and meeting spaces can help students become more comfortable with the corporate world in a safe environment. As the classroom evolves to become more dynamic and rows of single desks become a thing of the past, the furniture we use needs to be able to be flexible to adapt to different learning environments. 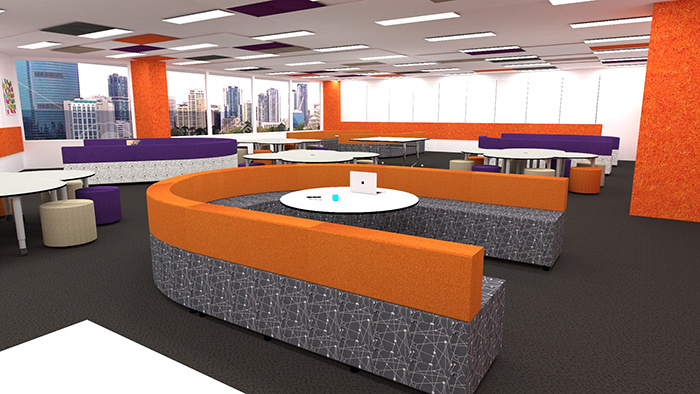 This includes being able to be reconfigured to enable collaboration and interaction in various group sizes. Computers and technology are essential components of the classroom learning environment today and as such, desks that accommodate this technology are a must. Furniture that accommodates this technology is crucial. Computer furniture must be ergonomic and flexible enough for students and integrate computer screens, keyboards and attendant wiring in a useful, organised, safe and unobtrusive way. Numerous studies continually show that useful, comfortable and attractive furnishings in the classroom significantly improve both student achievement and teacher satisfaction. Outfitting classrooms with furniture that's adaptable, flexible, comfortable, ergonomic and good-looking can lift the spirits and make learning easier for the students and increase the effectiveness of teaching. Properly furnished and equipped classrooms contribute to more positive student attitudes, increased enthusiasm and accomplishment.